Or maybe, you and your partner quietly decided it was time. Not every couple needs a big gesture to take the next step. In a beautiful moment, the two of you reached the conclusion that you intend to share the rest of your lives together. And we love it! First things first, hit the displays. There’s no better way to do research than getting a chance to look at rings in person- and even better: try some on! Keep this adventure balanced, and start to get a feel for what interests both of you. If he keeps pointing out white gold, consider how that metal looks with your skin tone. If you’re totally drawn to round diamonds, focus on what bands would match your cut. 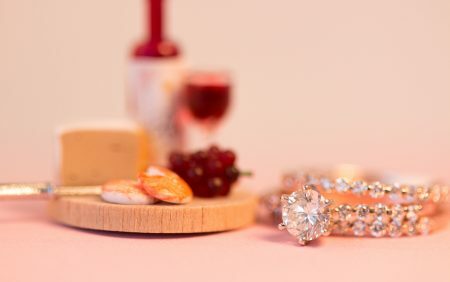 It’s okay if you have different tastes, but it’s important that if you and your partner are picking out a ring together, you’re actually working together on this. Listen to his opinions, and make sure it feels special to both of you. The best part about picking an engagement ring together? Picking out the wedding bands will be easier AND cheaper! We will always give you a discount on buying the bands and engagement ring at the same time. And this way, the two of you will get a chance to design the set that matches perfectly. You don’t have to worry about him getting your size right, and he doesn’t need to worry about giving you sticker shock! The two of you will be able to choose a ring that fits your relationship best. It also helps that you’ll be there when he’s spending the dollars: a good rule for marriage is to talk about money, and this will give you a really great start to figuring out your budgets. Most importantly: HAVE FUN! You get the chance to do this together, and it should be a wonderful experience for both of you to choose a symbol of your love and commitment.